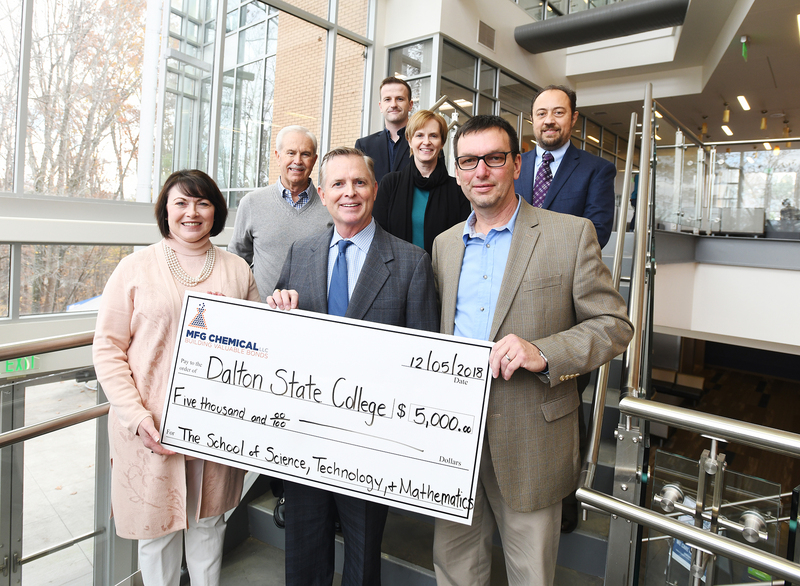 Dalton State College’s School of Science, Technology, and Mathematics has received a major gift from MFG Chemical as part of a multi-year partnership with the company. The gift will provide support for chemistry students and support the acquisition and maintenance of laboratory equipment in Dalton State’s chemistry program. Donors wishing to explore giving opportunities at Dalton State may contact the Dalton State Foundation at 706-272-4473. Pictured are Dr. Margaret Venable, president of Dalton State, front left, and Griffus, front right, receiving this year’s check from Keith Arnold, president and CEO of MFG Chemical. Also pictured are, Jim Cleghorn, an industrial relations volunteer for Dalton State, Thomas, Dr. Lee Ann Nimmons, assistant dean of the School of STM, and Guido De Stefano, chief science and technology officer for MFG.